Many of the greatest landscape painters have found figurative painting difficult, and a few have even had problems painting the smaller figures which could have enhanced their landscapes. JMW Turner’s studies of figures reveal a surprising awkwardness, although that never became manifest in smaller representations included in his narrative and landscape works. One solution for the painter whose figures are not up to the standard of their landscapes is to collaborate with another artist with complementary skills. 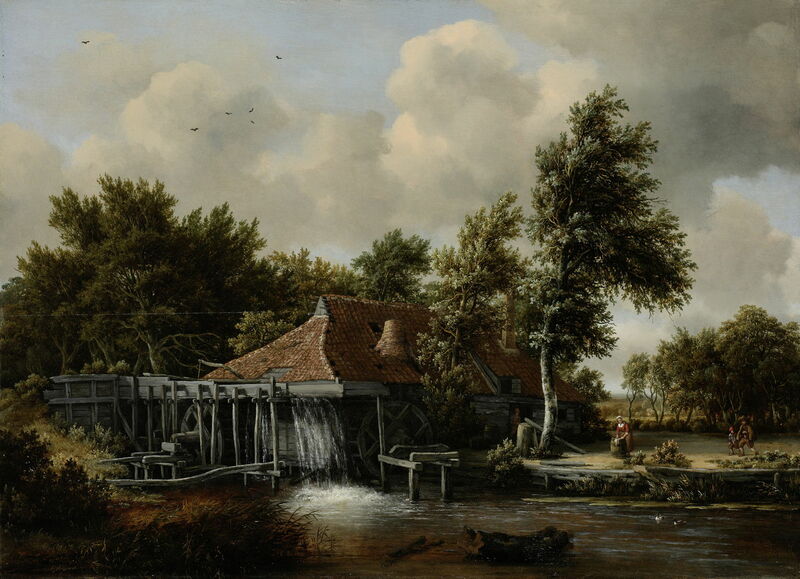 This article looks at two such partnerships, between Jacob van Ruisdael and Meindert Hobbema during the 1660s, and between Adolph Tidemand and Hans Gude in the middle of the nineteenth century. The landscapes of Jacob van Ruisdael are innovative, masterly, and strangely unpopulated. His countryside, forests, and watermills are almost devoid of figures, human or animal, in a way that appears quite unnatural, as if every scene was set early on a Sunday morning. The few figures which do appear are tiny, distant, and almost melt into their surroundings. 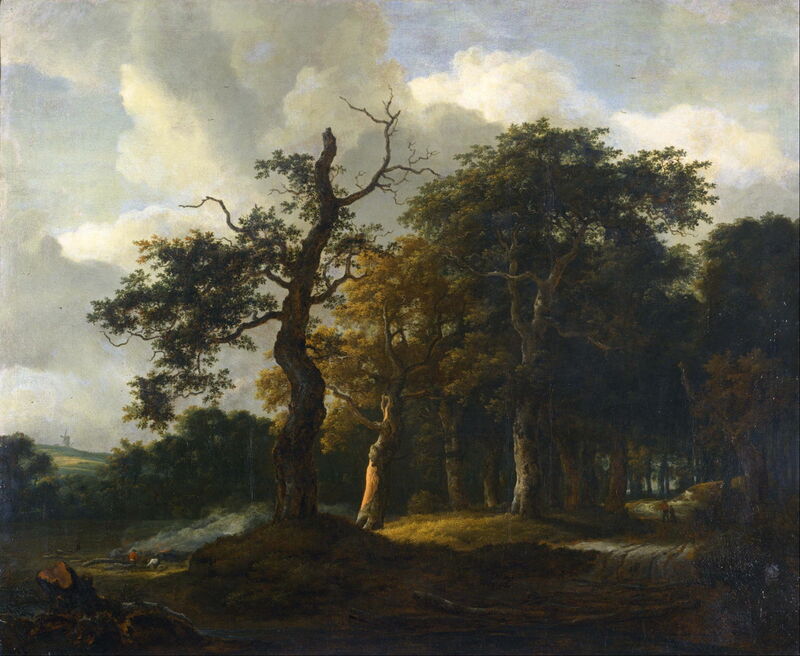 A Road through an Oak Wood (date unknown) is different, with a couple of travellers on its road, and woodland activities in the form of clearing and burning at the left. 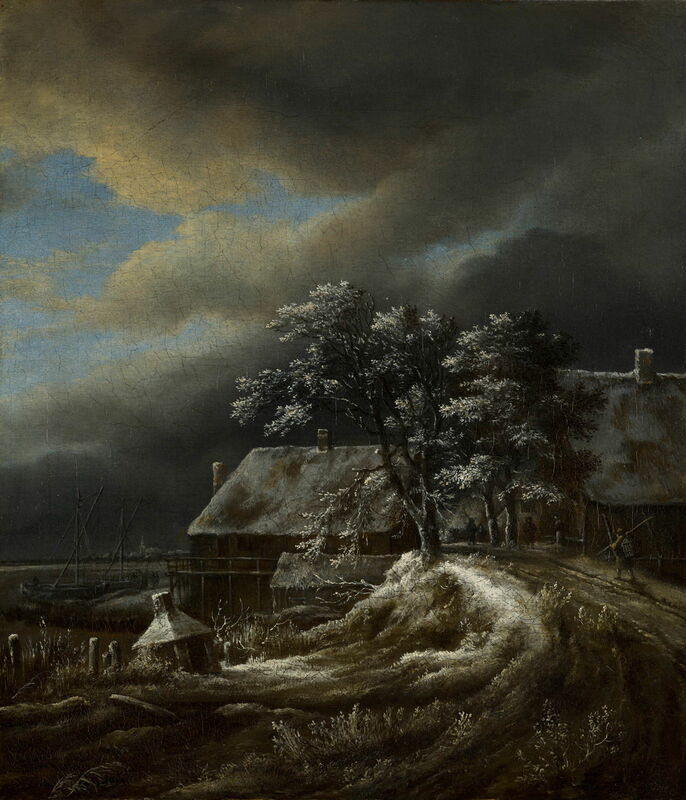 This may have coincided with his collaboration with Meindert Hobbema, who was at first van Ruisdael’s sole pupil before becoming his painter of figures. 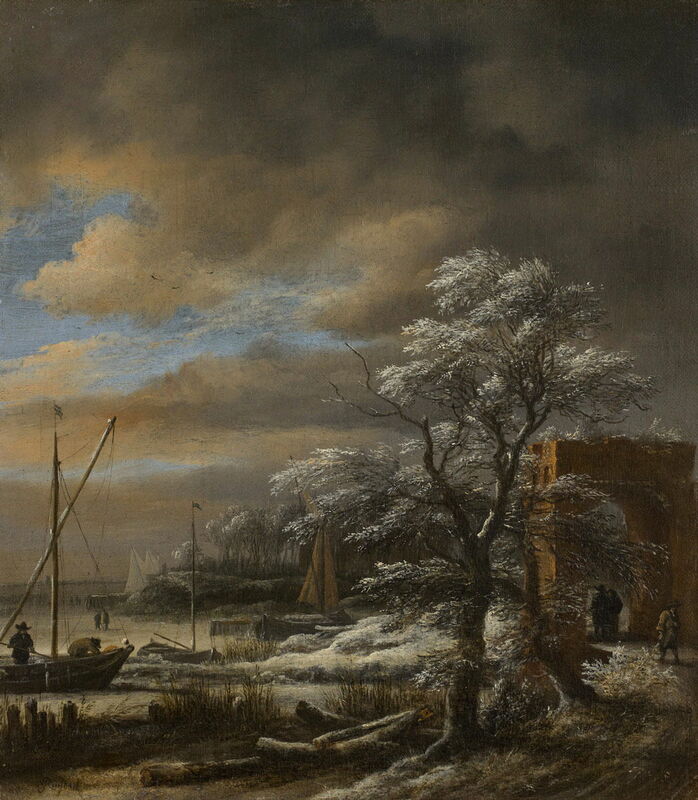 This partnership was most fruitful in these two paintings of Winter Landscape, above and below, both thought to have been made by van Ruisdael during the 1660s, when the two were working together. 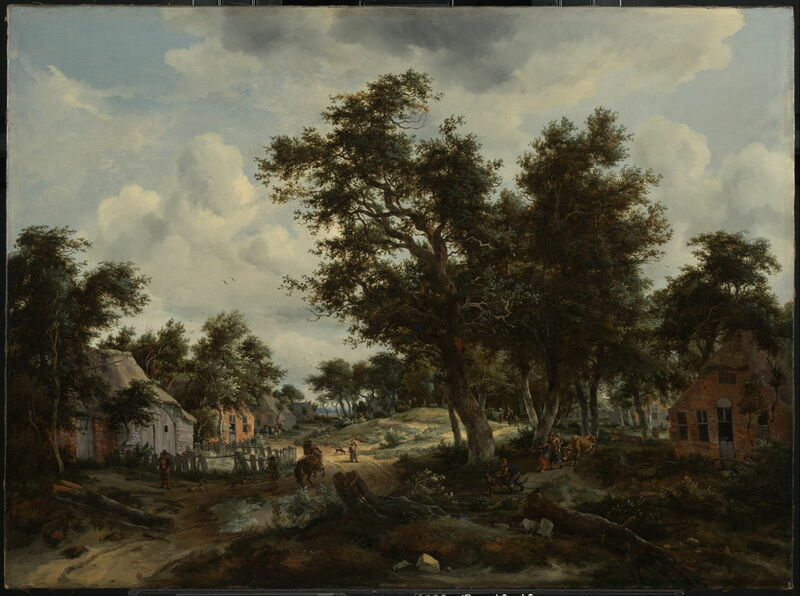 The problem today is that it appears that many works actually painted by Meindert Hobbema had previously been attributed to Jacob van Ruisdael. Meindert Hobbema (1638–1709), Wooded Landscape with a Watermill (1663), oil on canvas, 99 x 129 cm, Nationalmuseum, Stockholm, Sweden. Wikimedia Commons. 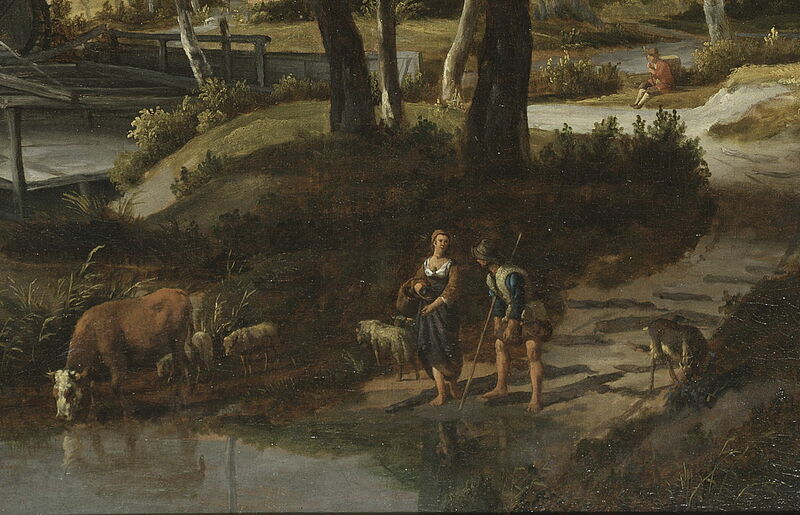 From the same decade, Hobbema’s Wooded Landscape with a Watermill (1663) features a man, a woman, and accompanying livestock in its foreground (detail below), something quite alien to van Ruisdael. Meindert Hobbema (1638–1709), Wooded Landscape with a Watermill (detail) (1663), oil on canvas, 99 x 129 cm, Nationalmuseum, Stockholm, Sweden. Wikimedia Commons. 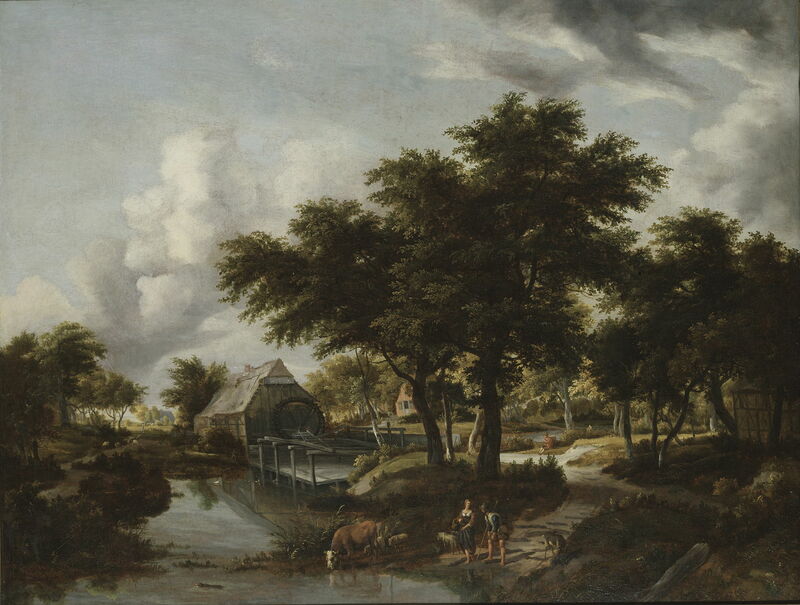 Meindert Hobbema (1638–1709), A Watermill (c 1664), oil on panel, 62 x 85.2 cm, Rijksmuseum Amsterdam, Amsterdam, The Netherlands. Wikimedia Commons. 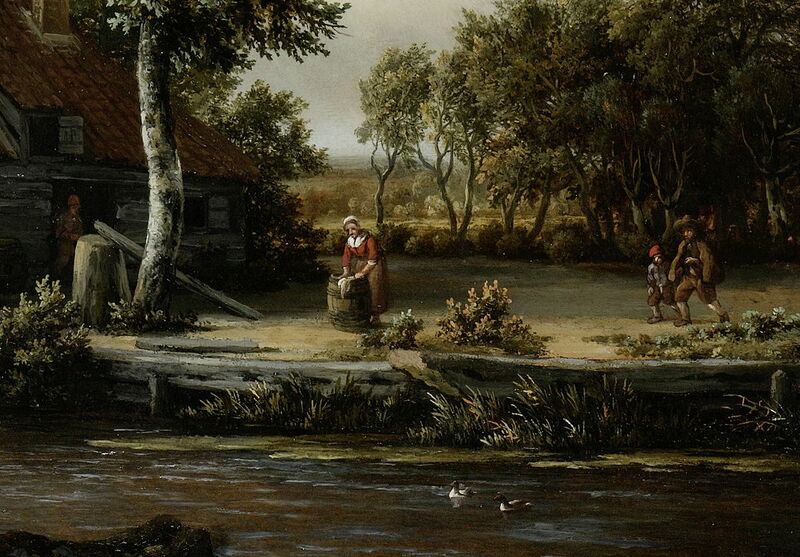 Meindert Hobbema (1638–1709), A Watermill (detail) (c 1664), oil on panel, 62 x 85.2 cm, Rijksmuseum Amsterdam, Amsterdam, The Netherlands. Wikimedia Commons. Meindert Hobbema (1638–1709), Forest Landscape with a Merry Company in a Cart (1665), oil on canvas, 90.5 x 109.8 cm, Rijksmuseum Amsterdam, Amsterdam, The Netherlands. Wikimedia Commons. 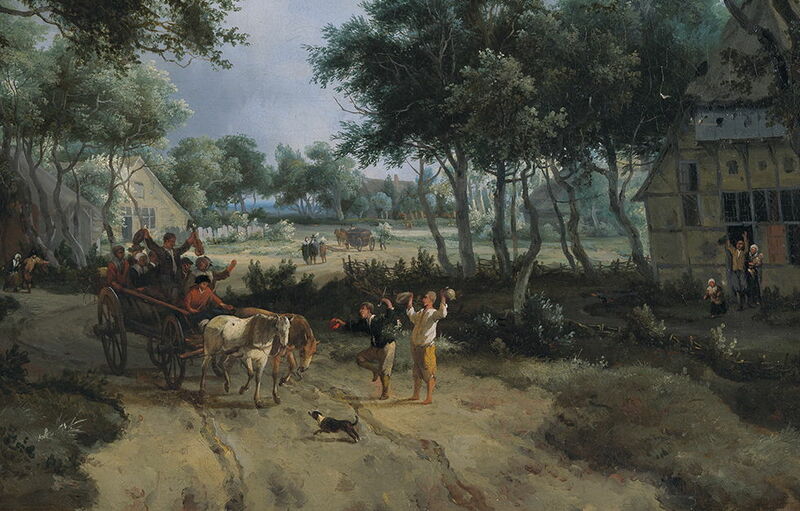 Hobbema’s forests are alive with those who live in their hamlets and travel their tracks, as seen in his Forest Landscape with a Merry Company in a Cart (1665). A passing cart brings people out of their houses to wave, and a dog runs in front of the horses (detail, below). Meindert Hobbema (1638–1709), Forest Landscape with a Merry Company in a Cart (detail) (1665), oil on canvas, 90.5 x 109.8 cm, Rijksmuseum Amsterdam, Amsterdam, The Netherlands. Wikimedia Commons. 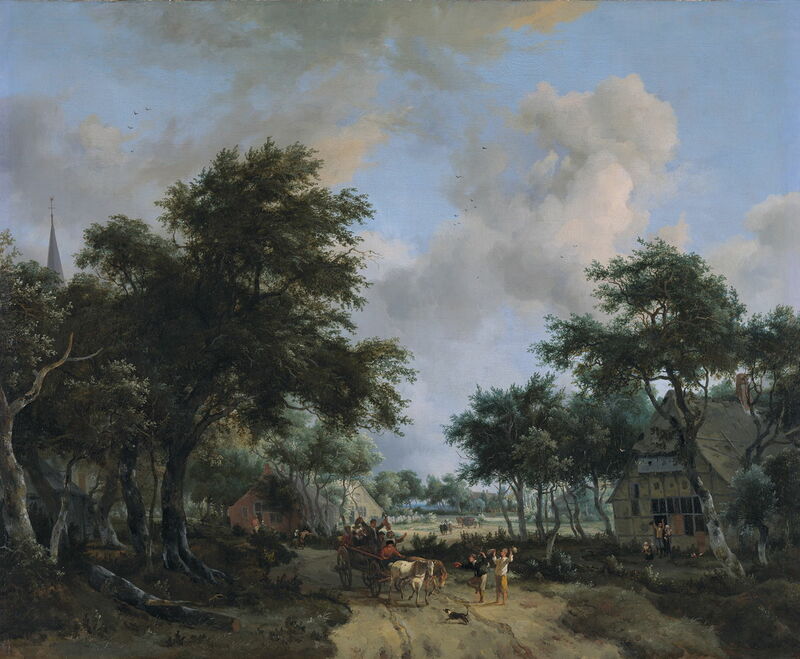 Meindert Hobbema (1638–1709), A Wooded Landscape with Travelers on a Path through a Hamlet (c 1665), oil on canvas, 97.5 x 130.8 cm, J. Paul Getty Museum, Los Angeles, CA. Wikimedia Commons. 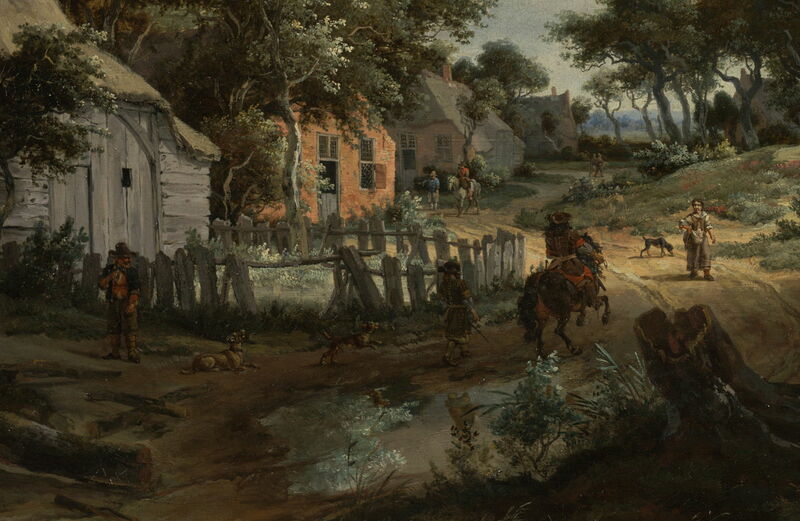 In Hobbema’s A Wooded Landscape with Travelers on a Path through a Hamlet (c 1665), there is a steady trickle of riders and walkers in transit through a hamlet, and even more dogs (detail, below). Meindert Hobbema (1638–1709), A Wooded Landscape with Travelers on a Path through a Hamlet (detail) (c 1665), oil on canvas, 97.5 x 130.8 cm, J. Paul Getty Museum, Los Angeles, CA. Wikimedia Commons. 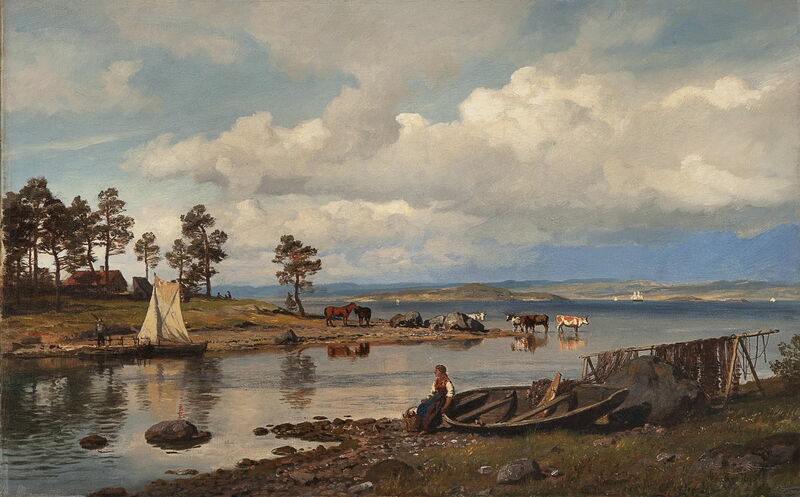 Two centuries later, when he was starting his career, the great Norwegian landscape artist Hans Gude recognised his difficulties in painting realistic figures. 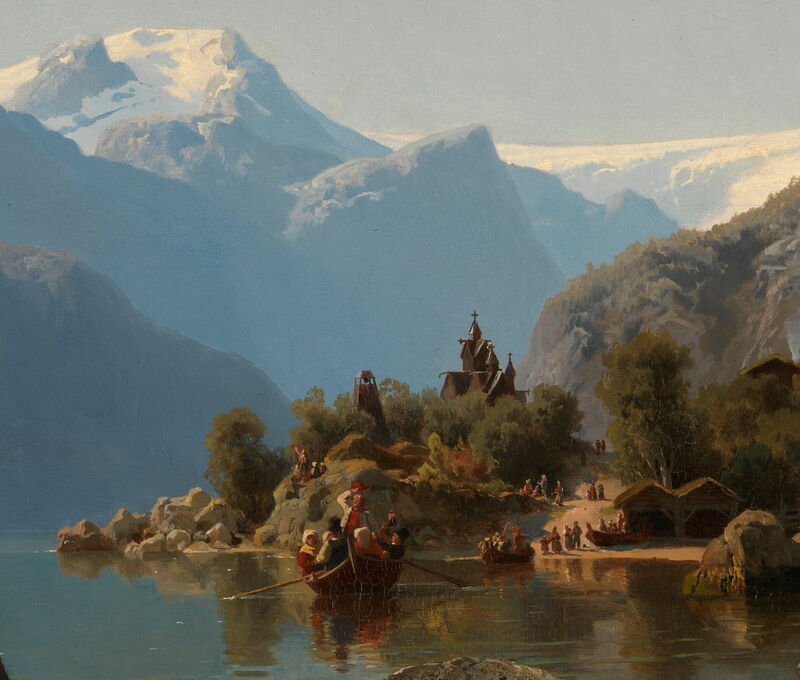 Rather than sticking to grand and deserted views of the fjords and mountains, he teamed up with Adolph Tidemand, an excellent Norwegian figurative painter who wasn’t particular good at landscapes. Gude and Tidemand painted some of their most spectacular works together. Brudeferden i Hardanger (Bridal journey in Hardanger) (1848) must be one of their best, and one of the finest detailed realistic paintings of that century. Both worked in meticulous detail to produce what appears a seamless integration, set in the far south-west of Norway, in the region to the east of Bergen. Gude and Tidemand worked together on several other highly successful paintings. 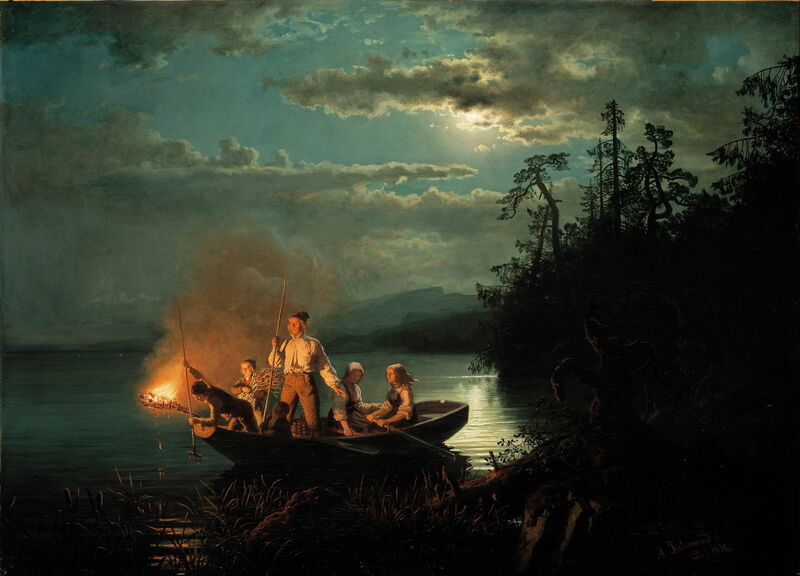 Although less of a pure landscape, their wonderful nocturne Lystring på Krøderen (Fishing with a Harpoon) (1851) is another fine example of their collaboration. 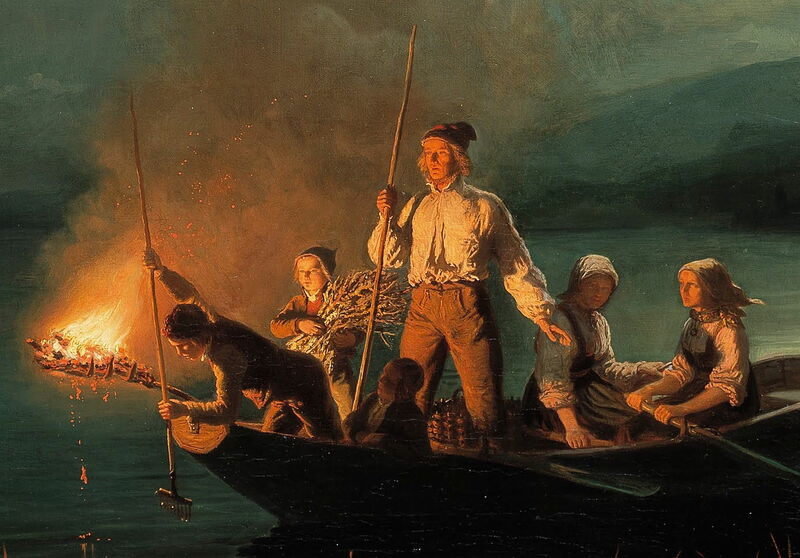 Adolph Tidemand (1814–1876) and Hans Gude (1825–1903), Lystring på Krøderen (Fishing with a Harpoon) (detail) (1851), oil on canvas, 115 × 159 cm, Nasjonalgalleriet, Oslo. Wikimedia Commons. Unlike van Ruisdael, Gude was able to address his shortcoming, and learned to paint figures which appear more natural and realistic. 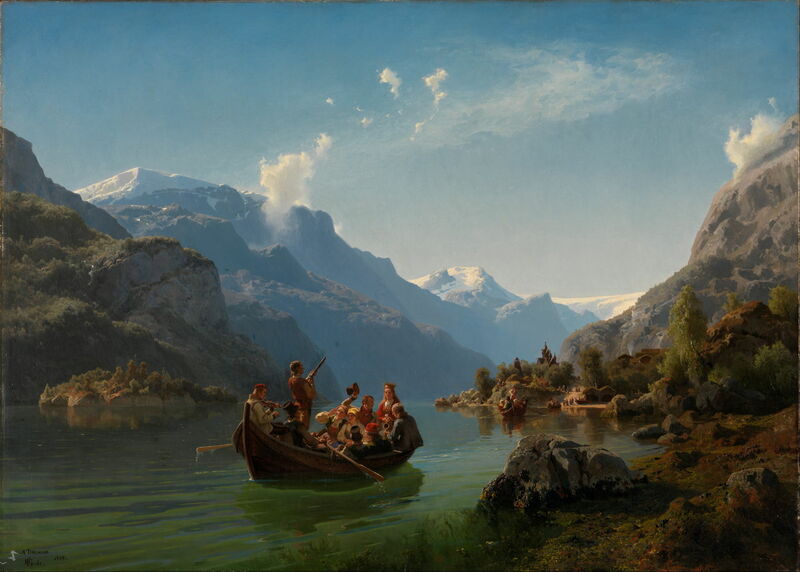 By 1875, when Gude painted his Fjord Landscape with People, he showed no sign of his earlier weakness. The people and livestock are here painted thoroughly competently without any assistance, but are mere staffage – unlike the brilliance of Tidemand’s previous wedding and fishing parties. I get the feeling that, when they were working together, Tidemand and Gude’s talents and skills competed with one another in a creative way, to result in a perfect combination of figurative and landscape painting. Posted in General, Painting and tagged figures, Gude, Hobbema, landscape, painting, staffage, Tidemand, Turner, van Ruisdael. Bookmark the permalink.